According to wikipedia, Sudoku is "a logic-based number placement puzzle. The objective is to fill a 9x9 grid so that each column, each row, and each of the nine 3x3 boxes contains the digits from 1 to 9. The puzzle setter provides a partially completed grid." 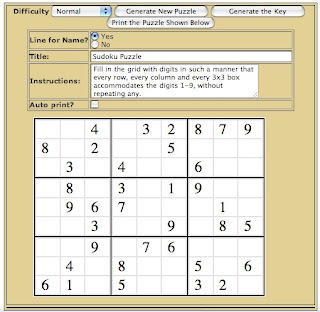 If you students are not addicted to completing Sudoku grids, this "Make Your Own Printable Sudoku Puzzles" will certainly be very useful and it is very easy to use as well. All you need to do is to choose the difficulty level and click "Generate New Puzzle". You also get to customize the worksheet by adding your own instructions and title. You can also add a line for students to write their name. You can also generate the answer key. November 23, 2009 at 1:24 p.m.
November 1, 2011 at 11:19 p.m.